About Muriel – The Muriel Matters Society Inc.
Muriel Lilah Matters (November 12, 1877 – November 17, 1969) was an Australian born suffragist, lecturer, journalist, educator, actress, and elocutionist. 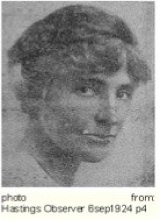 Based in Britain from 1905 till her death, Matters is best known for her work on behalf of the Women’s Freedom League (WFL) during the height of the militant struggle to enfranchise women in the United Kingdom. Matters was an extremely prominent member of a critical mass of people agitating for women’s suffrage. Largely active between 1905-1924, she began her life of activism aboard the Women’s Freedom League caravan which toured England’s south-east. Although tirelessly campaigning for women’s voting rights in the English Counties for many years, Matters is most recognised for chaining herself to the grille of the Ladies’ Gallery in the British House of Commons on 28 October 1908. The ‘grille’ was a piece of ironwork placed in the Ladies’ Gallery that obscured the women’s view of parliamentary debates. A symbol of the oppression of women in a male-dominated society, it was her firm conviction the grille should be removed. Her non-violent solution to chain herself to the grille was the centre-piece of a larger protest conducted by the Women’s Freedom League. While attached to the grille Matters, by a legal technicality, was judged to be on the floor of Parliament and thus, the words spoken by her that day are still considered to be the first delivered by a woman in the House of Commons. Matters is also identified with attempting to shower King Edward VII and the British Houses of Parliament with handbills dropped from an airship on 16 February 1909. With the overriding aim to garner attention to the cause of women, she took to the skies armed with 56 lb of Women’s Freedom League pamphlets and an airship emblazoned with the words ‘Votes for Women’. However, due to adverse wind conditions and the rudimentary motor powering the balloon she never made it to the Palace of Westminster but instead hugged the outskirts of London. Nevertheless, her exploit was a success as it created publicity for the suffrage movement generating headlines in newspapers around the world. Although these two deeds punctuate Matters’ life, they mask a hard working and strong willed activist who spent an entire life acting upon deeply held principles. These convictions orbiting around thoughts of gender equality, universal access to education and a career open to talent may seem commonplace in contemporary society but at the beginning of the twentieth century they were ideals which had to be won. All the different elements contained within her life of activism culminated in 1924 when she ran as the Labour Candidate for the seat of Hastings in the General Election. Although she did not gain enough votes to unseat the incumbent (Lord Eustace Percy), this actualization of her belief that women had a natural right to participate in parliamentary decision making bodies was a victory in itself and provided an example which others soon followed.